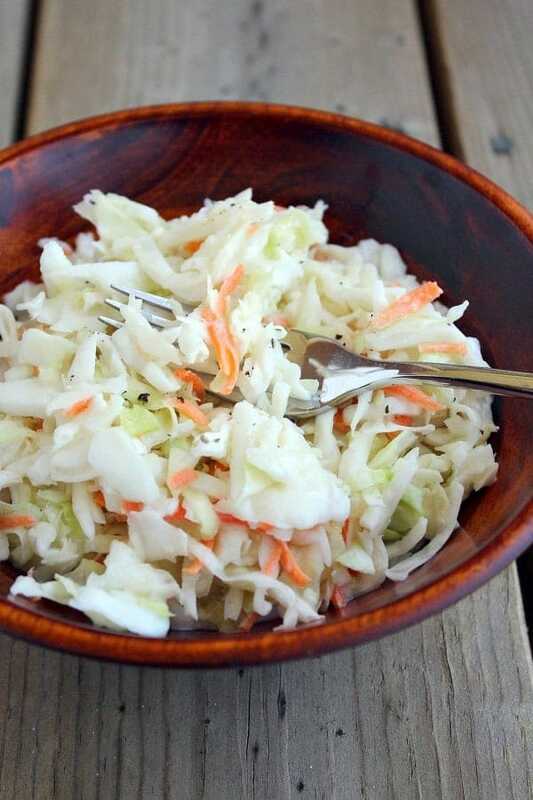 Healthy coleslaw is so easy to make and you won’t even notice that it has less calories – it has the same great taste as classic creamy coleslaw! 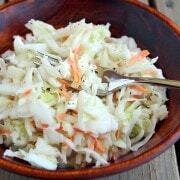 I already did a version of this coleslaw, but this time I reduced the fat even further. Plus it was time for a few prettier pictures of it. Girlfriend needed a makeover. Bad. As do I, which is why I am making reduced calorie/fat versions of things. Time to slim down. ASAP. After a couple of months of sitting in hospital waiting rooms and a lot of restaurant food being consumed, my body was not looking….well….it wasn’t looking how I like it to look. Enter gym membership (can I tell you how GREAT it feels to be back in the gym?) and healthy eating. Coleslaw just screams summer picnic to me. It is so creamy and refreshing along side of a burger or pulled pork. 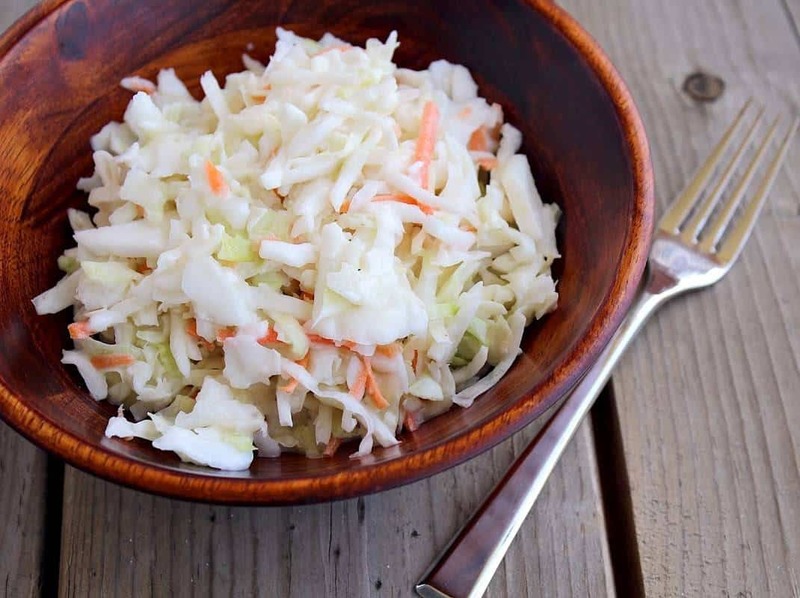 With this healthy coleslaw, you can have your cake and eat it too. Guilt-free! And it is still the traditional creamy variety that everyone knows and loves. I added some Dijon mustard because I like the little kick it gives, but if you’re a traditionalist, feel free to leave it out. Mix together mayo, yogurt, sugar, vinegar, celery salt, and mustard until smooth with a fork. 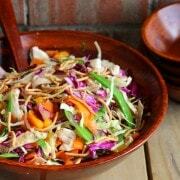 Pour over cabbage and carrots, mix well. Cover and refrigerate for at least one hour. Serve garnished with freshly cracked black pepper or chopped fresh parsley. Verdict: This is great. You almost can’t tell it isn’t full-fat. 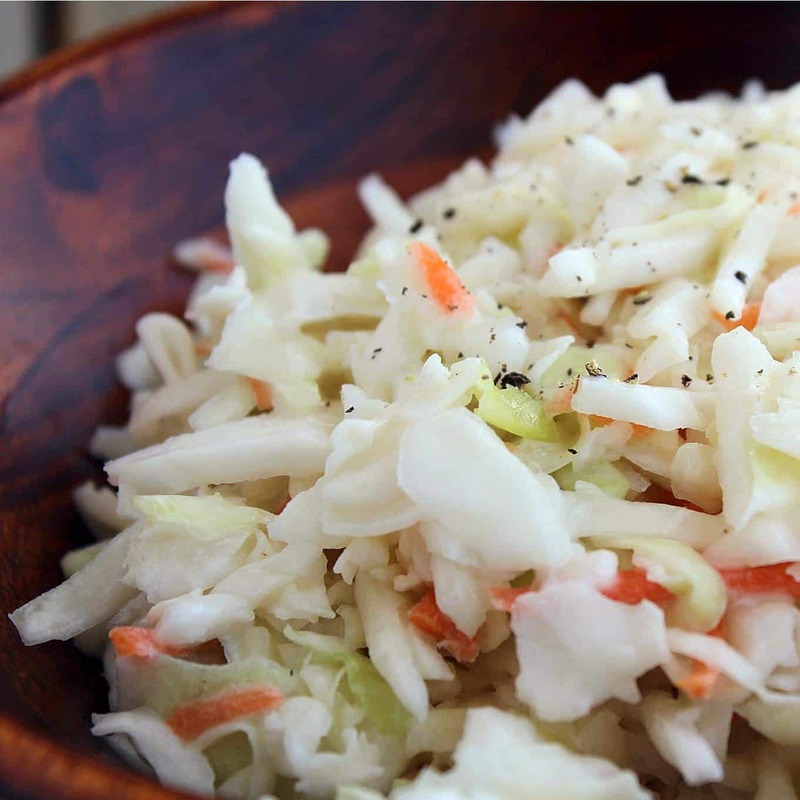 Husband’s take: “You know I’m not really a fan of coleslaw, but this is really good!” Proof that he wasn’t lying to be nice to me? He ate it the next day too. Changes I would make: None. Although, I do love my coleslaw with some fresh parsley mixed in, but I didn’t happen to have any in the fridge the day I made this. Would have made for prettier pictures, too! 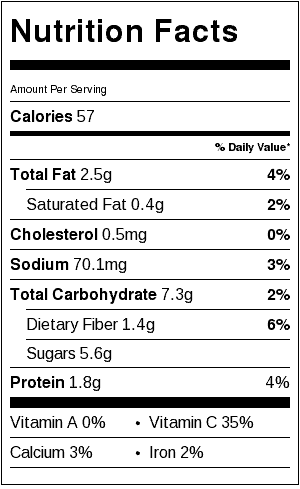 Also, the Greek yogurt does make this slightly on the tangy side. If you like it sweeter, just add a bit more sugar. If you like it even tangier, add more vinegar. It’s good with celery SEED in it too. I like the addition of Dijon. Isn’t Greek yogurt your new-ish best friend? 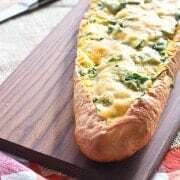 It makes many of my recipes lighter and healthier and I have never, ever felt like I was missing out on taste or texture. Yay! 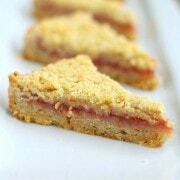 This recipe looks divine. And, with a lot of health issues fairly resolved over her, I have eaten myself silly since February and it’s time to “stop the insanity” and eat healthfully again. I hear ya, you are preaching to the choir Rachel. Take care. Happy belated Easter. Nice job Rachel. I applaud you for getting a gym membership!